LONDON--(BUSINESS WIRE)--Technavio analysts forecast the global building information modeling software market to grow at a CAGR close to 20% during the forecast period, according to their latest market research report. The growth of 5D building information modeling is one of the major trends being witnessed in the global building information modeling software market 2018-2022. Construction projects undertaken through 3D building information modeling do not provide a platform for the integration of time and cost factor. This led to the emergence of 5D building information modeling, which considers more dimensions. 5D building information modeling can be considered as an evolution of 4D and 3D building information modeling. Moreover, with the help of 5D building information modeling, an investor can obtain information on the following things easily - deviation from the pre-determined project schedule and budget; in-house database with complete details regarding the cost and labor productivity rates; efficient preparation of cost schedules, and real-time cost estimation for easy and quick comparison with the target cost. Therefore, with such advantages, the market is expected to witness a positive outlook during the forecast period. The rising demand for large-scale project management is one of the main factors that will drive the adoption of building information modeling solutions. Currently, organizations are focusing on cultivating and managing the resources necessary for efficient product outputs, which increases the requirement for efficient solutions for large-scale construction project management. The primary purpose of the building information modeling solutions is to automate processes to ensure maximum outputs by managing resources and maintaining a regular follow-up. The key benefits of employing building information modeling solutions in large-scale project management are process management, projecting profitability and automation. The global building information modeling software market research report provides market segmentation by product (software and services), and by region (the Americas, EMEA, and APAC). It provides an in-depth analysis of the prominent factors influencing the market, including drivers, opportunities, trends, and industry-specific challenges. The EMEA region held the largest share of the market in 2017, accounting for close to 42% share, followed by the Americas and APAC respectively. However, during the forecast period, the APAC region is expected to register the highest incremental growth. 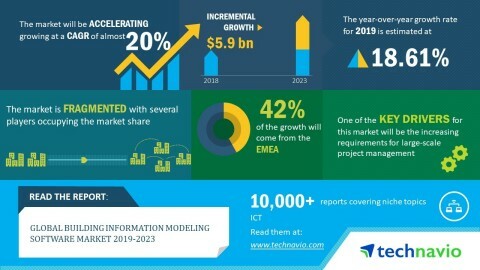 Technavio forecasts the global building information modeling software market to grow at a CAGR of close to 20% during the period 2019-2023.